Jordan is not thrilled to be going to a private school several neighborhoods away from his home in Washington Heights, New York City, since it means leaving his best friend and having to deal with a whole new social class of peers. Also, if he has to go to a new school, he wishes it were an art school instead, since drawing comics is one of his favorite things to do. He is picked up the first day by his student guide, Liam, who is fairly uncommunicative, and is thrown into a sea of mainly white faces. There is a boy who is Nicaraguan, although classmates give him a hard time about being Mexican, and a few African-American students. The teachers seem to have no idea how to deal with students who are not white, frequently calling Jordan and Drew the names of other students, to the point where the two make a joke of calling each other things like Ja'vion and Darius. Jordan not only feels like he doesn't fit in at his new school, but he also feels that being in the new school disconnects him from his Washington Heights crowd. He does manage to make a few friends, including the nice but super annoying Alex, who wears a hand puppet and talks in puppet voices. Eventually, Jordan learns to embrace his pink-short wearing new community and realizes he can make his two worlds work together. The other characters are also realistic. I loved that Liam was embarased enough by his wealth that Jordan occasionally thought he might be a scholarship student, too. Alex is absolutely a very common middle school type as well, although the addition of a reason for her to be quirky and odd was novel-- I've had a lot of cat-ear-wearing students whom other students think are odd who act this way for no reason at all! It's nice that there are a number of different reactions to cultural differences at the school, some of which are nice and some of which aren't. The students all have their reasons for acting the way they do, and most are understanding. I just wish the same could be said of the teacher characters, who were rather mean or misguided with no motivation to be so. The illustrations are unique, pleasantly colored (love the use of "salmon"!) and highly expressive. Like the work of Victoria Jamieson or the Holm's this is both easy to read but also has some meat to the plot, which is sometimes not the case in graphic novels. I've been waiting a long time for more graphic novels with African-American main characters. Robinson's Jake the Fake and Patterson's Public School Super Hero are a good starting point (I still want to see Robb Armstrong do one! 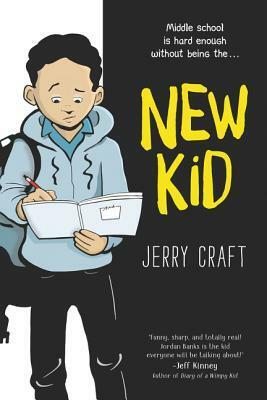 ), and Craft's work illustrating other writer's work is good, but this whole graphic novel is well-balanced and fun for any middle school reader who likes this medium.